This unit was completely renovated for an open space plan, with custom built-ins in the Living Area, and custom cabinets in the kitchen and all the bathrooms. The style is transitional, with touches of contemporary. This is the new open space plan for the Living, Dining and Kitchen. The color scheme is mostly neutral, with accents of orange and aqua. Plans that are so large and open often need to be divided into several functions, or multiple seating arrangements. In this case, we have the dining area, the main seating area, a desk area and a small conversation area. The lamps are mercury glass with raffia shades. The sofa and loveseat belonged to my client. We updated them by adding the floral sofa pillows made from Zoffany fabric. The orange fretwork pillow on the sofa is from Drexel Heritage. I added the large chair and ottoman, which is covered in a natural linen with blue contrast welts. The desk chair is from Palecek. I chose a blue fabric for the seat so that it would contrast nicely with the warm honey tones of the custom built-ins and desk. This corner of the living area provides a wonderful view of the beach. In the picture, it is obvious where I drew my inspiration for the colors. The kitchen was renovated by completely knocking down the wall that separated it from the living area. An island was added with a step-up bar counter. All-new stainless steel Wolf appliances greatly raised the value of the kitchen and helped it to look updated. The two-tone mixture of cabinets gives the kitchen warmth and depth. The backsplash is a mixture of polished and tumbled travertine. The set of 9 framed prints are actually old postcards, and the two bird sculptures are from Phillips Collection. This is the Master Bedroom. This room, with its ice-blue walls and cream bedding, provides a soothing atmosphere for beachside living. The large Uttermost mirror fits teh scale of the room, while giving it more depth. 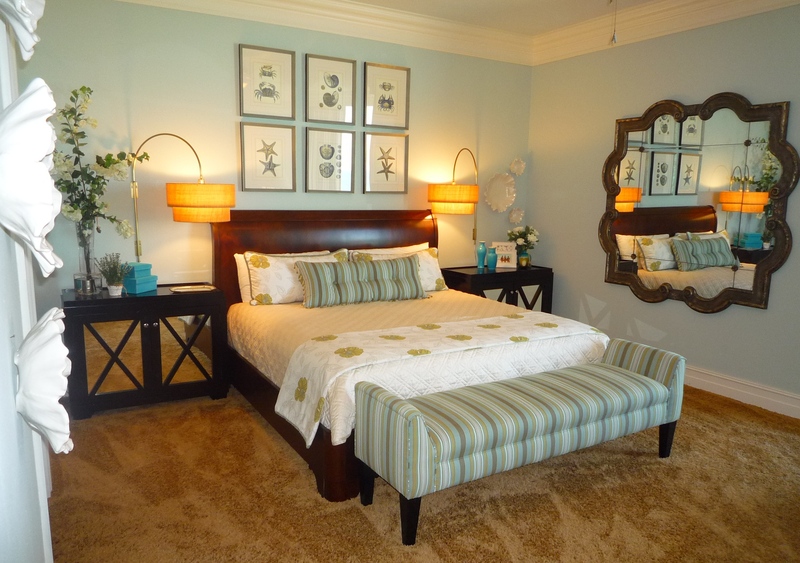 The mirrored nightstands are from RD Imports, and the bed is from Lane Furniture. The large swivel chair provides the perfect spot to use the natural light to read a book, or to swing around and watch the beach. 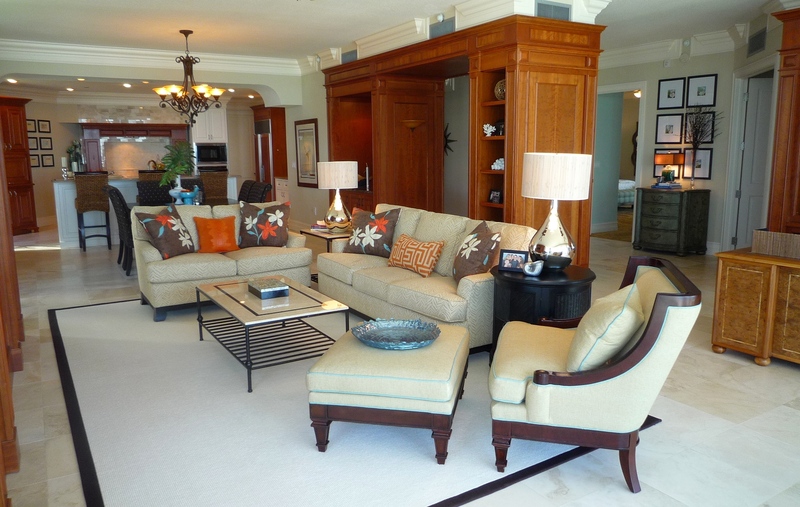 The ottoman is from Drexel Heritage, and the floor lamp is from The Natural Light. In the kids’ room, I wanted to use a menagerie of colors for a bright, playful atmosphere. The red Barcelona chair in the corner pulls out the red in the benches and bed pillows, as well as the red bunk bed that is also in this room. The accent boudoir pillows on the beds are trimmed with white shell fringe. The hand-sewed starfish pillows on the bunk beds are original Cara McBroom creations! I thought the beds needed a touch of whimsy, so I used some scrap fabric and sketched out a starfish, then tufted the centers with red glass beads. The empty space below the bunk is a good place for storage baskets.